"I love savoy cabbage and we serve it as a side to almost anything. This is one of my favorite ways to make it, quick and easy with a little butter and cream." Place savoy cabbage in a pot, cover with cold water, and bring to a boil. Cook for 1 minute, remove from heat, and drain. Rinse under cold water. Squeeze savoy cabbage as dry as possible with your hands. Melt butter in a pot and add savoy cabbage. Add cream and season with salt, pepper, and nutmeg. 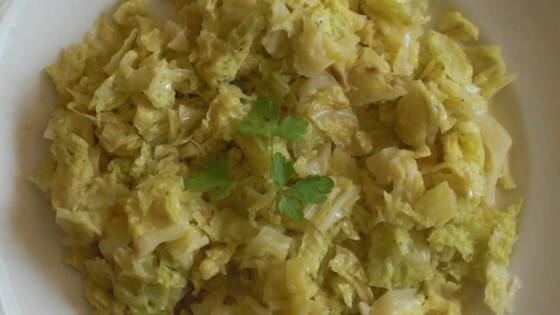 Cook until cabbage is soft and creamy, 2 to 4 minutes. I used 1/2 & 1/2 and it was still very tasty. Next time I'll use the heavy cream.